The film takes place in a post-nuclear-apocalypse 1997. The world lives a Mad Max ramshackle existence where untainted drinking water is rare and gangs of mutant cyborgs roam the wastelands on BMX bikes. Our protagonist is the kid (Munro Chambers), a teenaged orphan who lives as a scavenger, selling 80s pop culture paraphernalia for potable water and living in his secret pink-flamingo decorated bomb shelter home/clubhouse. His hero is the local cowboy badass Fredrick the Armwrestler (Aaron Jeffery) and his chief hobby is reading wartime comic books about the superhero Turbo Rider. Life stinks, but he’s got a comfortable niche until one day at the playground while reading his comic he bumps into a beautiful and unnaturally perky girl named Apple (Laurence Leboeuf). Apple steals the show in this movie. Without delving into spoiler territory, she’s both an expansion and a subversion of the “Manic Pixie Dreamgirl” trope because for all her happiness, it’s clear she’s not entirely right in the head. And most subversive to the MPDG stereotype, she has an actual character arc! Apple so aggressively wants to be the kid’s friend that he reluctantly lets her tag along. As much as he tries to keep her at arm’s length in this depressing future, her relentless playfulness and positivity prove infectious and he warms to her. But just as they’re really starting to connect, a cyborg bounty hunter captures Apple and the kid manages to escape by stumbling into the buried spaceship of the real life Turbo Rider, now deceased. The kid recovers the super suit, complete with a ridiculously overpowered laser-blasting turbo glove (albeit with a very unreliable ammo supply), and becomes Turbo Kid! Armed with his new super powers, the kid sets out to rescue Apple from the local warlord Zeus (a very hammy Michael Ironside) and his army of cannibals. A special shout out is required for Zeus’ buzzsaw-shooting chief henchman Skeletron (Edwin Wright) whose performance is entirely wordless and delivered from behind a mask, but whose bug-eyed and twitchy physicality makes for a memorable character. The major way this movie deviates from the sci fi coming of age adventures of my youth is the battles that commence between the kid and Zeus are gory beyond shock and intentionally enter the realm of firehose-bleeding hilarious. 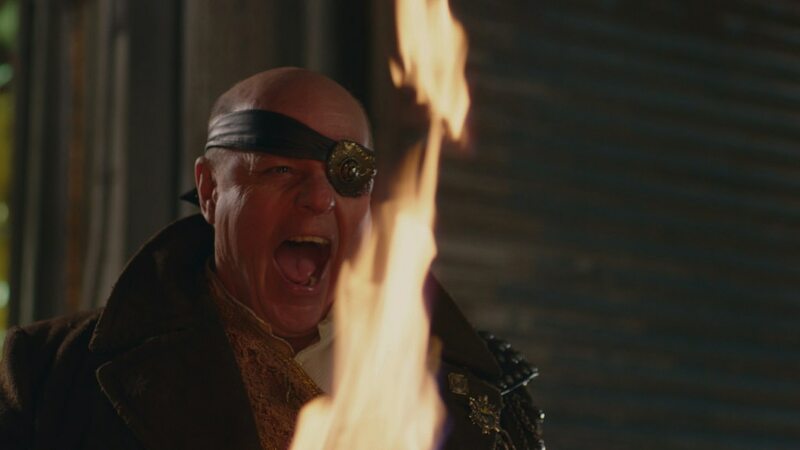 Turbo kid first started out as a short film “T is for Turbo” submitted to the ABCs of death competition by the movie’s hive-minded French-Canadian trio of directors (RKSS). The slapstick gore and pitch-perfect 80s music (Le Matos) was so impressive, people approached the directors about making a feature length version. That Turbo Kid recreated and expanded on the gory laffs was expected, but it’s amazing that the movie managed to have so much heart at the same time. Most nostalgia films tend to look and feel like a modern CGI-excess production, elbow you in the ribs every time they drop a reference so you don’t miss it, and have a nasty undercurrent of contempt for their subject matter. Kung Fury, I’m looking at you. Turbo Kid is almost completely 80s-style practical effects (right down to the Ghostbusters storm clouds made by squirting milk into a brine tank), is perfectly functional as a film in its own right whether or not you notice the references, and communicates such love for 80s adventure movies that every time a predictable trope comes along it’s in a loving, ”of course that’s supposed to happen” kind of way. Kung Fury is like eating frosting straight from the can. The entire can. Even past the third spoonful when it stops being fun. Turbo Kid is like a slice of cake with frosting; yummy and delightful and leaves you wanting more. It’s my favorite film of 2015 and I can’t recommend it highly enough!